Visit a newspaper or magazine office Ask for a tour of the various divisions (editorial business , and printing ) . During your tour, talk to an executive from the business side about management's relations with reporters, editors, and photographers and what makes a "good" newspaper or magazine. All on the same day, watch a local and national network newscast, listen to a radio newscast, and (with your parent's permission) view a national broadcast news source online. List the different news items and features presented, the different elements used, and the time in minutes and seconds and the online space devoted to each story Compare the story lists, and discuss whether the stories are fair and accurate. Explain why different news outlets treated the stories differently and/or presented a different point of view. Visit a radio or television station . Ask for a tour of the various departments, concentrating on those related to news broadcasts . During your tour, talk to the station manager or other station management executive about station operations, particularly how management and the news staff work together , and what makes a "good " station. If possible, go with a reporter to cover a news event. Choose a current or an unusual event of interest to you, and write either a hard news article OR a feature article about the event. Gear the article for print OR audio OR video journalism. Share your article with your counselor. With your parent's permission and counselor's approval, interview someone in your community who is influential because of his or her leadership, talent, career, or life experiences. Then present to your counselor either a written or oral report telling what you learned about this person. With your parent's permission and counselor's approval, read an autobiography written by a journalist you want to learn more about. Write an article that tells what you learned about this person and the contributions this person has made to the field of journalism. Attend a Scouting event and write a 200-word article (feature or hard news) about the event. Use either the inverted pyramid style or the chronological style. Review the article with your counselor, then submit it to your community newspaper or BSA local council or district newsletter for consideration. Write two newspaper articles about the event, one using the inverted pyramid style and one using the chronological style . 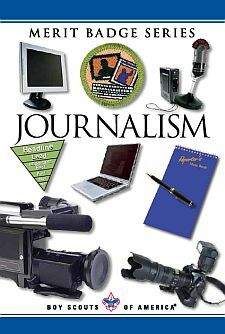 Using a radio or television broadcasting style write a news story , a feature story and a critical review of the event. Take a series of photographs to help tell the story of the event in pictures. Include news photos and feature photos in your presentation. Write a brief synopsis of the event as well as captions for your photos.